Ideal for professional furniture makers as well as for home woodworkers, Jet's affordable 708580 JBM-5 benchtop mortiser features a 1/2-horsepower induction motor and is designed to take up to 1/2-inch chisel bits. The dependable rack-and-pinion head adjustment gives you accurate drilling control, while its heavy-duty cast iron and steel construction provides durability and stability for years of use. Features At only 44 pounds, the Jet 708580 is sturdy but also easily maneuvered, plus it reverses on its base to allow for mortising in long stock. The 4-3/4-inch head stroke is great. Bits are easy to change. Just flip open the steel door on either side (other models on the market often have doors made of flimsy plastic) to gain easy access to the chuck. And, thanks to the 4-inch chuck key, there's little chance of banging or scraping your knuckles while switching bits. The mortiser's feed handle adjusts so you can choose the most comfortable position for each application, and it also offers a quick-setting depth stop and a removable toggle switch that prevents accidental or unauthorized use of the tool. It's set on a heavy-duty cast-iron base with four predrilled mounting holes. Other features include a three-jaw drill chuck that keeps a positive grip on mortising bits for chisels up to 3/4-inch in size, two hinged side doors for easy access to the chuck, and a reversible column for mortising larger stock. It's backed by a 5-year limited warranty. Specifications Motor: 1/2 horsepower Spindle speed: 1725 rpm Chuck size: 3/8-inch Chisel shank capacity: 5/8- and 3/4-inch Head stroke: 4-3/4 inches Chisel center to fence: 3-1/2 inches Fence size: 1-9/16 x 13-3/4 inches Base size: 7-5/8 x 12-3/16 inches Dimensions: 14.4 inches by 22.8 inches by 11 inches What's in the Box One Jet 708580 JBM-5 benchtop mortiser, one hydraulic cylinder, one handle, 3/4- and 5/8-inch chisel bushings, one spindle extension, one chuck key, one table, hold down, fence assembly, screws, and owner's manual. 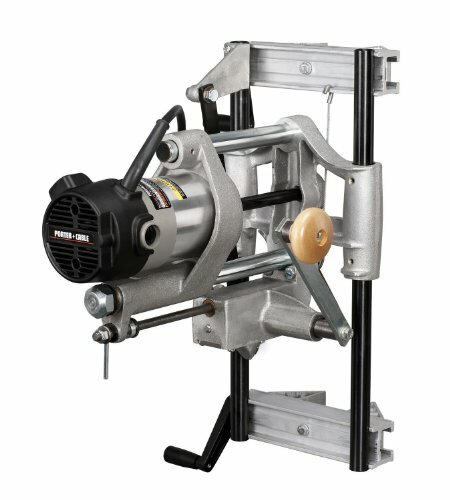 Combines 1/2-horsepower motor for solid performance and a heavy-duty cast iron and steel construction. Benchtop X-Y Mortising Machine #34-260 gives precision positioning of your work for boring mortises because of the sliding, X-Y axis table. Front controls move the table either forward-and-back, or side-to-side along the dual dovetail ways. The front clamp pushes work against the cast iron rear fence, as well as acting as a hold down. BENCHTOP MORTISER - This benchtop X-Y Mortising Machine gives precision positioning of your work for boring mortises because of the sliding X-Y axis table. POWERFUL - With powerful HP Motor with 1750 RPM this motor quickly cuts mortises in the toughest woods without stalling. CONSISTENT CUT - Use this benchtop mortiser with dovetail column ways with adjustable stop for solid, consistent cutting of multiple mortises. STABILIZED - Feel safe with your consistent work because this benchtop has a gas filled stabilizer that helps control downward and upward chisel motion during your hard work. CONTROL - The X - Y directional table with stops provides ultimate positioning control for boring mortises and allows you to focus on the work. For ultimate control use this Rikon benchtop mortiser for all of your needs. 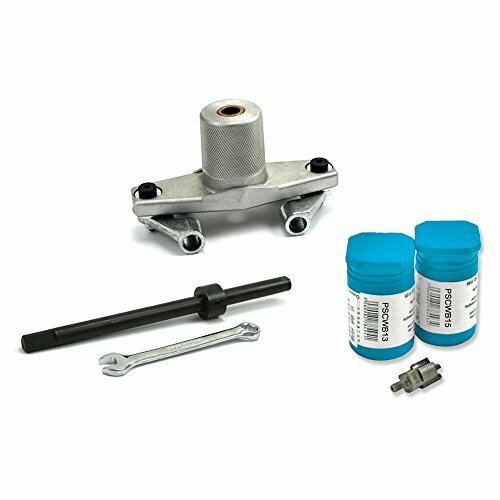 Offset Housing Kit to supplement the DBB Door Lock Mortiser by Souber Tools. This housing is used to offset the location of drilling an edge bore in a door or door jamb. 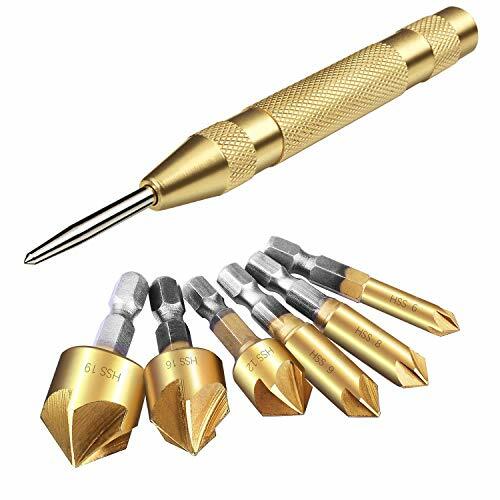 Excellent quality: These flute Countersink Drill bit set are machined from high Speed steels and are available in 6 different diameter sizes from 1/4'', 5/16'', 3/8'', 1/2'', 5/8'', 3/4''. Note: we have our own factory to produce this drill bit and can offer best and prompt reply to any problem or question you meet. Perfect Design: Five-blade chamfering with a groove, easier to discharge debris and the High Carbon Steel Drill Bit not easy to blunt. Besides 1/4 hex shank countersinks are suitable for a quick drill and they don't slip in drill chucks. 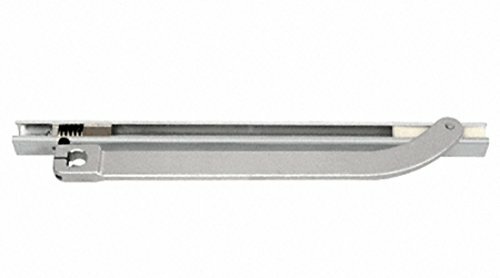 Eliminate chatter vibration: all of them have 90 angles on the point for sharp and precise countersinking. The cutting edge is honed and Hardened for sharpness. A chatter-free, five-flute design with staggered cutting teeth contributing to free chip flow and Rapid chatter free cutting. Widely Application: Ideal for wood and so on. Also applies to wooden board and so on. Warm tips: you can make deep countersinks easily by setting the Countersink depth stop to allow the Countersink to drill more deeply into the work surface. Remember to measure the size of your plug to ensure your countersink's body will make the right-size hole. Please contact us firstly if you need any help during operation, we will offer help at soonest time. Remember when your holes were square? Strengthen your workpieces with the WEN Benchtop Mortising Machine. Our powerful 5-amp motor provides you up to 1725 rotations per minute, making easy work out of even the toughest of woods. The spacious chuck accepts bits anywhere from 1/32 of an inch to 1/2 of an inch (1/4 to 1/2 inch for chisel bits), giving you the versatility needed to take on any project. With spindle travel of 4-1/4 inches and a max stock thickness of 4 inches, you ll be able to create sturdy and reliable mortises up to 3 inches in depth. The pneumatic spring head returns easily and smoothly while the spring-loaded fence allows for both fine-tune and large scale adjustments. The spacious table measures in at 13-1/2 by 6 inches with a work-piece hold down that accepts boards up to 3-1/2 inches thick. The adjustable feed handle rotates freely to prevent collision with your workpiece, springing back into place once you select your optimal start and stop points. The onboard depth stop prevents you from drilling past your intended distance. The spring-loaded protective chip guard easily flips up and down depending on your current needs. 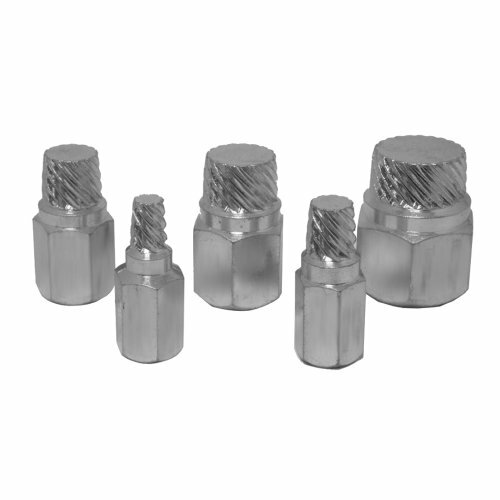 This package also includes three chisel bits, measuring in at 1/4, 3/8 and 1/2 inch in size, along with an extra chuck extension adapter, a 3/4-inch chisel bushing, and a 10 by 8-inch cast iron base. And because its a WEN mortiser, your bench top mortising machine comes backed by a two-year warranty, a nationwide network of skilled service technicians, and a friendly customer help line, all to make sure you remember WEN. 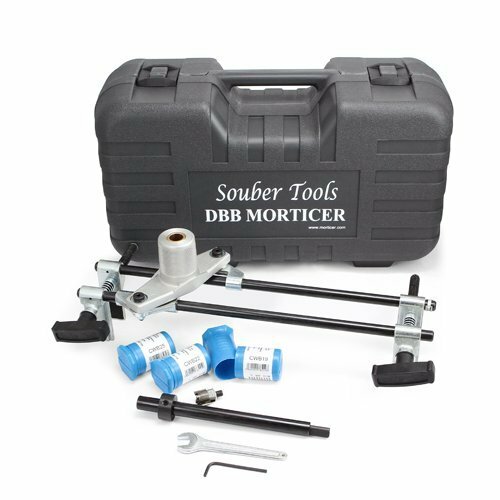 Used and acclaimed by locksmiths and builders alike, the DBB morticer has proved itself an invaluable tool for anyone who fits mortice locks. This clever jig cuts a mortice for both the lock body AND the face-plate quickly and easily--saving time and money. Vertical guides, plus height and depth stops mean you cut where you want--never where you didn't intend. The basic kit includes the three most common carbide-tipped wood cutting bits. 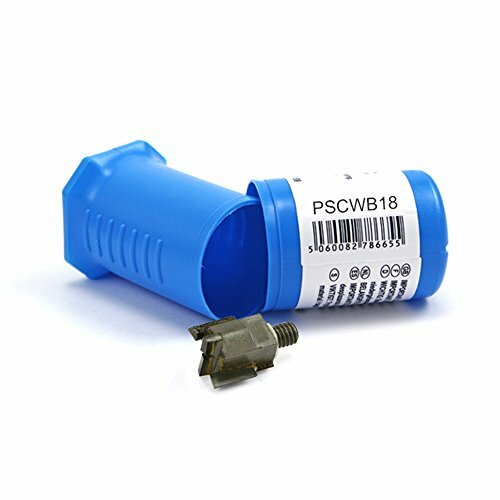 These are 3/4" (PSCWB19), 7/8"(PSCWB22), and 1" (PSCWB25). A wide array of additional wood-cutting and aluminum-cutting bits are available separately. Imported from England. 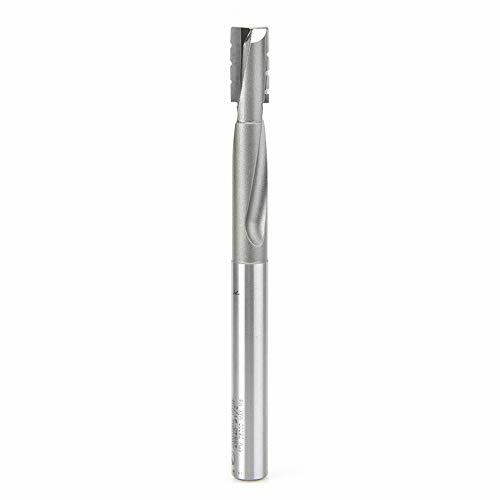 Includes 3 Popular Size Carbide Cutters! Application: Need to be used with hand drill or woodworking trimming machine (electric router). 1. Manual measuring, please allow 1 ~ 3mm error. Easy to install and operate.Can be used on Wooden door, plank, solid wood door. Robust construction and precision manufacture.Increases accuracy and speed of mortice cutting. Fast and accurate on doors from 0cm - 13.5cm thick . 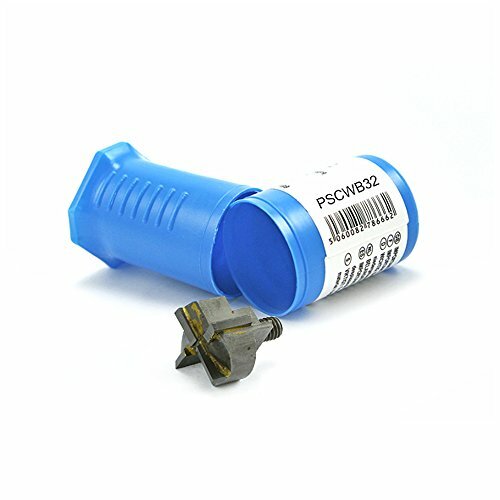 Supplied complete with operating manual and plastic carry case.All parts are replaceable with three cutters (18mm, 22mm, 25mm) .Users just use electric drill to connect with this device, then you can start work. 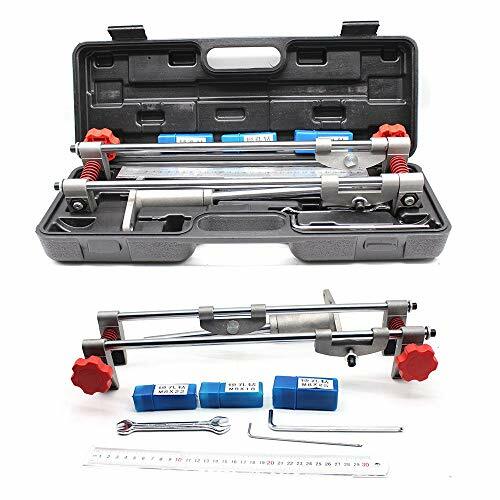 This tool set is specially giving help for opening the slot and hole of the doors.Uses vertical guides, height and depth stops to ensure you do not overrun the cut area. Quite suitable for installing hotel doors, security doors and modifying door locks, etc. 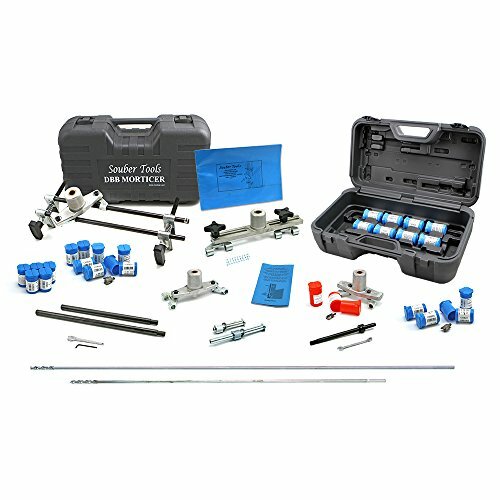 Master Kit includes the DBB Door Lock Mortiser plus 30 extra Cutters and Accessories. Amazon.com Hand mortising is a thing of the past, and the Porter-Cable 513 1-1/2 HP lock mortise will get the job done quicker and more efficiently than ever before. The powerful 11 Amp motor spins at 27,500 RPM for incredibly detailed cuts. Particularly useful when making cuts for box locks, the 513 heavy-duty lock mortise cuts mortises up to 7 x 1-1/4 x 4-3/4 inches (LxWxD). The 513 will accommodate doors as thick as 4-1/2 inches, and it will automatically center the cutter on the doors edge no matter how thick it is. Its durable steel and alloy construction ensure years of reliable, accurate cuts. Hand mortising is a thing of the past, and the Porter-Cable 513 1-1/2 HP lock mortiser will get the job done quicker and more efficiently than ever before. The powerful 11 Amp motor spins at 27,500 RPM for incredibly detailed cuts. 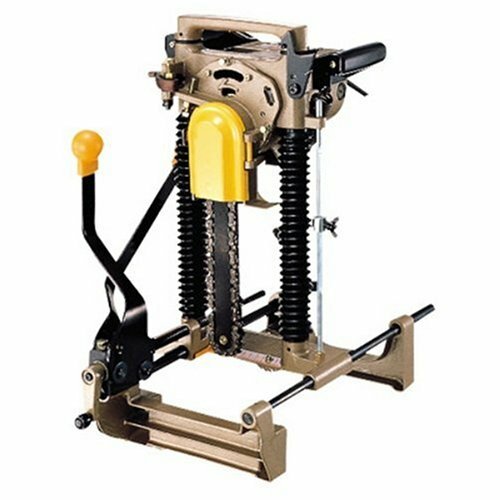 Particularly useful when making cuts for box locks, the 513 heavy-duty lock mortiser cuts mortises up to 7 x 1-1/4 x 4-3/4 inches (LxWxD). The 513 will accommodate doors as thick as 4-1/2 inches, and it will automatically center the cutter on the doors edge no matter how thick it is. Its durable steel and alloy construction ensure years of reliable, accurate cuts. Extremely portable at only 38.1 lbs. Featuring heavy-duty cast iron construction and a powerful 1-horsepower motor, the Powermatic 719T tilt table mortiser (model 1791264K) is designed to take on the most demanding mortising jobs. A heavy rack-and-pinion gear system is equipped with a spring-loaded, six-position, adjustable handle and a unique gas-filled shock for smoother mortising operations. The head is mounted with adjustable jibs, providing easy maintenance for years of trouble-free service. The 719T includes a powerful 1-horsepower motor and a heavy enclosed steel cabinet for plenty of storage (view larger). Features The Powermatic 719T isn't just a mortiser; it's a high-tech joint building lab. Its large wooden table (measuring 20-1/4 inches by 7 inches) gives plenty of work support and will adjust to any angle between 0 and 35 degrees. The table can also move left to right and forward and backward on dovetail ways with the large hand wheel controls. Adjustable linear stops and a flip-down stop allow for precise repetition. The quick-adjust clamp provides plenty of work-holding force and swivels to accommodate angled work pieces. The heavy enclosed steel cabinet provides plenty of storage inside for chisels and accessories. It's backed by a five-year limited warranty. 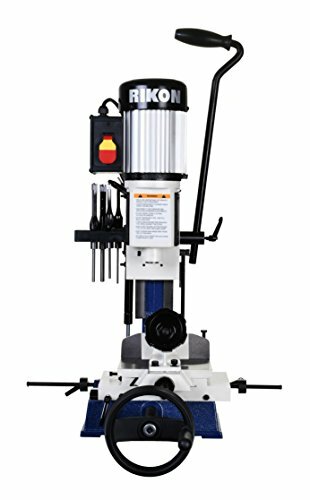 Specifications Spindle speed: 1725 rpm Chuck size: 1/2-inch Chisel capacity: 1/4-inch to 1-inch Head stroke: 6 inches Chisel center to fence: 4 inches Fence size: 4-1/2 inches by 20-1/4 inches Table tilt: 0 to 35 degrees Table size: 7 inches by 20-1/4 inches Table travel: 15-1/2 inches longitudinal; 4 inches cross Motor power: 1 horsepower Dimensions: 21-1/4 inches by 21-5/8 inches by 74 inches What's in the Box One Powermatic 1791264K 719T tilt table mortiser; wooden table; operating handle; chuck key; enclosed stand with shelf; bushings to fit 5/8-inch, 3/4-inch and 1-1/8-inch chisel shanks; work stop assembly; and operating instructions. 1. Easy to install and operate. 2. Can be used on Wooden door, plank, solid wood door. 3. Robust construction and precision manufacture. 4. Increases accuracy and speed of mortice cutting. 5. Fast and accurate on doors from 0cm - 13.5cm thick . 6. Supplied complete with operating manual and plastic carry case. 7. 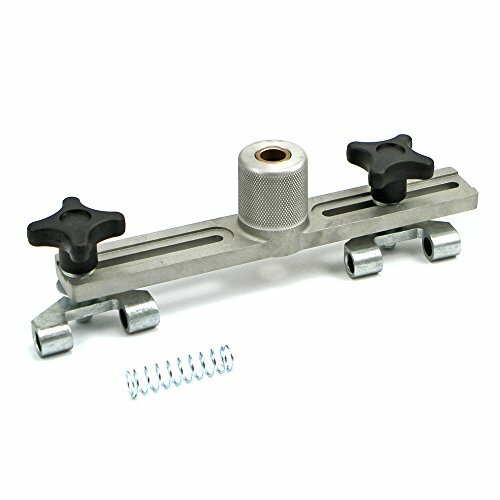 All parts are replaceable with three cutters (18mm, 22mm, 25mm) . 8. Users just use electric drill to connect with this device, then you can start work. 9. This tool set is specially giving help for opening the slot and hole of the doors. 10. Uses vertical guides, height and depth stops to ensure you do not overrun the cut area. 11. Quite suitable for installing hotel doors, security doors and modifying door locks, etc. Money Back Guarantee : SHZICMY would like to issue full refund if finally we could not resolve your problem or you are not satisfied with the result. We will try our best to help you solve it. Suitable for installing hotel doors, security doors and modifying door locks, etc. Comes with 3 cutters (M8 x 0.71in, M8 x 0.87in, M8 x 0.94in), and 2 spanners for convenient operation. Equipped with a plastic carrying case for convenient storage and portability. Carbide Tipped Mortice Wood Cutter 31.8mm or 1-1/4". For use with the DBB Lock Mortiser by Souber. The DBB Mortiser's unique cutter design means they can be changed and fitted in seconds, while the jig is in position on the door. The specifically designed cutting edges are chisel shaped to cut deep without clogging. Carbide Tipped Mortice Wood Cutter 31.8mm or 1-1/4"
The DBB Mortiser's unique cutter design means they can be changed and fitted in seconds, while the jig is in position on the door. The specifically designed cutting edges are chisel shaped to cut deep without clogging. 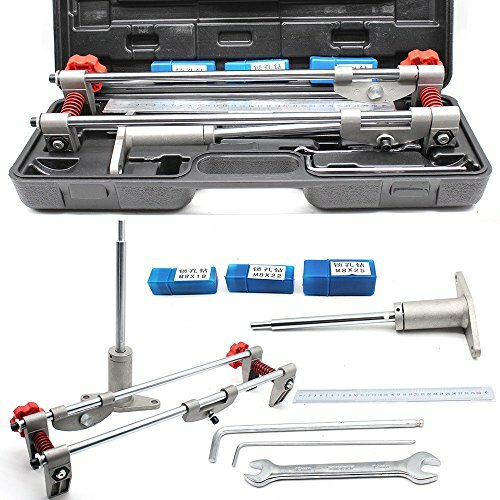 DBB Carbide Tipped Wood Cutter 11/16"
The DBB Small Bore Package includes accessories available for the DBB Door Lock Mortiser, packaged together for your convenience. Used with the DBB Door Lock Morticer, the DBB Small Bore Package includes one DBB Small Bore Housing, one DBB Small Bore Shaft and two DBB Carbide Tipped Wood (Small Bore) Cutters: 13.2mm and 14.6mm. This package can be stored inside the existing DBB Door Lock Mortiser case.